Murder by Gaslight: Reverend Green, Wife-Poisoner. Reverend George W. Long arrived in Western New York in the Fall of 1864, presenting himself a Methodist minister from the south. He appeared to be in good standing, with credentials from several Southern and Western conferences so the presiding elder of the district stationed him at the Methodist church in Centerville. Long had a very agreeable personality and had soon gained the confidence of his congregation. Before long he met and married a young woman named Frances Doolittle in a nearby town and brought her to Centerville. All seemed well except that the meager salary of a minister was not enough to meet Long’s needs. He began to borrow money from the brethren at the church. They were happy to lend him money until it became apparent that he had borrowed more than he could pay back. He told his creditors not to worry, he had money invested in Dunkirk, Ohio and would go there and withdraw some. He borrowed some more to cover his expenses then left for Dunkirk. After he had been gone for some time he sent word back to Centerville that he had met a claim agent who offered to purchase some land he owned in Texas and had to go to New York City to conclude the transaction. From there he planned to go to Pittsburgh then return home. That was the last letter anyone in Centerville received from Reverend Long. More than two years later, a Connecticut police detective arrived in Centerville, tracking a man named William Green. The detective was carrying a picture of Green which the Methodist congregation recognized as their own Reverend Long. They were forced to admit that they had been swindled. When he left Centerville Reverend Long had not gone to Dunkirk, Ohio, he went to Utica, New York where he registered at the Northern Hotel as William H. Green. There, as Reverend Green, he preached sermons and made political speeches, and as Professor Green he delivered temperance lectures. Though, as Reverend Long, he still had a wife in Centerville, on December 20, 1866, Green married a widow named Searles in Guilford, New York and moved with her to West Cornwall, Connecticut. There he claimed to be from Texas and became active in local politics and gave lectures on political affairs. The following spring, Mrs. Green’s health began to fail; she was diagnosed with a pulmonary difficulty. On May 6, shortly after tea, she was taken with violent convulsions which continued intermittently until her death at about 12 o’clock. The physician called to attend her remarked on the unusual manner of her death, he could not explain it but suspected foul play. Mrs. Green was buried four days later and her husband remained in town for about a month then suddenly moved to Utica. A week later he married an Irish girl who worked as a chambermaid at his Utica hotel. Suspicions were aroused in West Cornwall when it was learned that Reverend Green’s sudden departure was prompted by improper proposals he had made to a married lady in that town. They also found it suspect that a Methodist minister was married by a Catholic priest five weeks after the death of his wife. The body of Mrs. Green was disinterred, and her organs examined by Professor Baker of New Haven. He detected strychnine in her stomach and liver and concluded that Mrs. Green had been poisoned. William Green was arrested in Utica and brought back to West Cornwall where he was examined by Justice Gold prior to being bound over for trial by the Superior Court. During an intermission in the examination, Green was sent to the Litchfield jail from which he escaped by jumping from a window. He was recaptured when he was found hiding in a barn where he had attempted to cut his own throat. Before his trial, Green was confident that he could explain his position and the final determination of the jury would clear him. But his behavior in prison did not reflect this confidence, he made two unsuccessful attempts to take his own life. At the trial the evidence against William Green aka George Long was overwhelming and he was convicted of first-degree murder. “By Telegraph,” Columbian Register, November 16, 1867. “A Clerical Wife-Poisoner and Chevalier d'lndustrie,” National Police Gazette, September 21, 1867. “Green the Wife-Poisoner,” Norwich Aurora, November 20, 1867. “Rev. 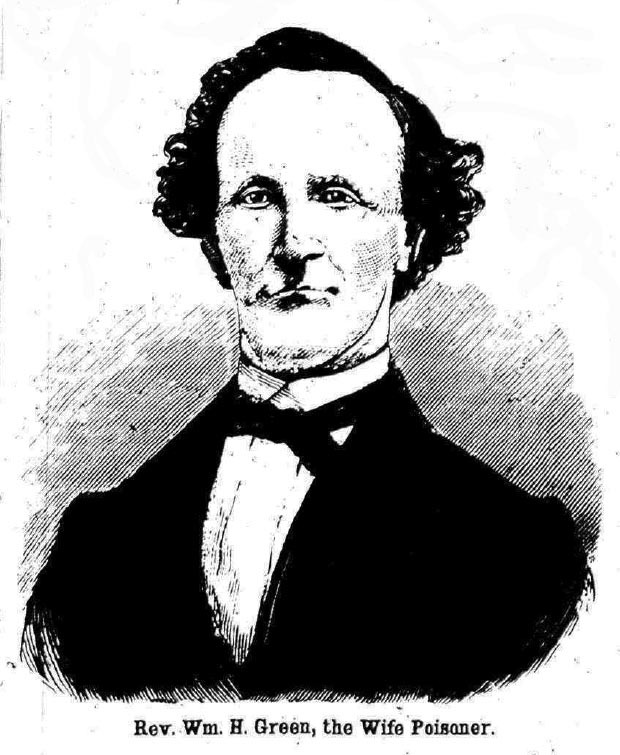 W. H. Green, the Wife Poisoner,” National Police Gazette, November 16, 1867. I could not find any further information on the final outcome of "Reverend" George W. Long/ William Green...was he hanged or did he do life in prison till his natural death? He was not executed in Connecticut. Beyond that, I don't know what became of him. Maybe the miserable wretch finally did kill himself....what a monstrous outrage of a man.